A blizzard hitting the U.S. Rockies on Wednesday was forecast to move eastward over the next day, threatening to bring new flooding to the Plains states including parts of South Dakota and Missouri that are still recovering from last month’s inundation, Reuters reported. “This is potentially a life-threatening storm,” Patrick Burke, a meteorologist with the NWS’s Weather Prediction Center in Maryland, said Wednesday. 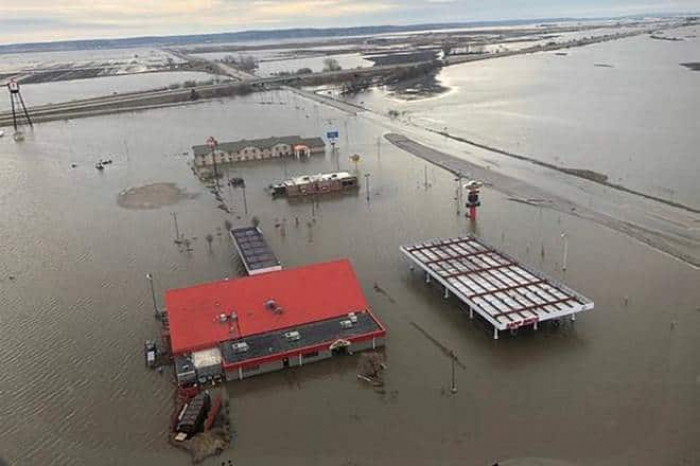 A cyclone last month dropped heavy rains over that region, causing extensive flooding along the Missouri River and more than $3 billion in damage to property and crops in Nebraska and Iowa. Nearly 500 flights were canceled at Denver International Airport on Wednesday, about a quarter of its total schedule, according to FlightAware.com, an airline tracking website.